"You mess with canonical history at your peril." 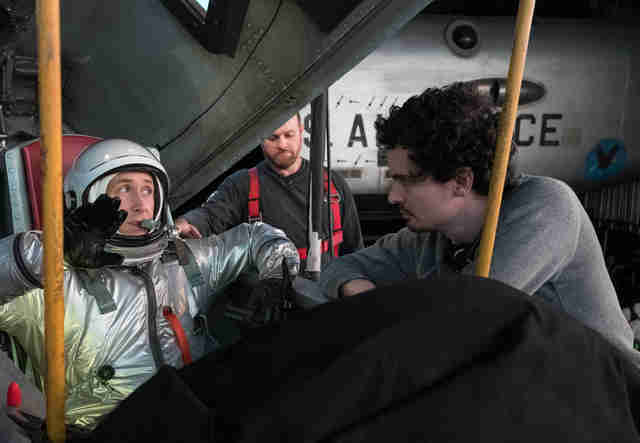 Screenwriter Josh Singer is parroting Neil Armstrong's son Rick to describe how he approached recreating the moon landing for First Man, the Armstrong biopic in theaters now. Singer, who won an Oscar for writing Spotlight, has become a go-to guy for intensely researched historical cinema that is often thrillingly unromantic. 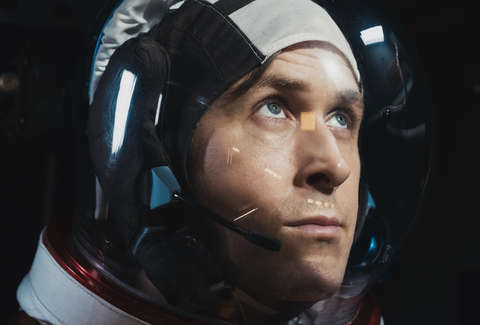 First Man, directed by La La Land's Damien Chazelle and starring Ryan Gosling, certainly falls into that category. The film paints Armstrong as a solemn man who doesn't emote even when faced with deep personal tragedy or extreme stress. Case in point: A crucial scene just before he boards Apollo 11 finds Armstrong blankly telling his children how he might die on his historic mission. Meanwhile, the depiction of the actual space travel is both exhilarating and technically proficient. Claustrophobia, danger, and wonder are there in equal measures. Singer got on the phone with Thrillist to talk about what it was like to turn one giant leap for mankind into a remarkable piece of modern cinema. Singer and Chazelle knew early on they wanted to structure the movie around three major flights for Armstrong. The first, which opens the film, is his trip in an X-15 in which he bounces off the atmosphere. It's a near-fatal moment that arouses the suspicions of Armstrong's boss at NASA's Flight Research Center over his capabilities, while back at home, Armstrong's daughter is suffering from a brain tumor. The next mission is the Gemini 8 flight -- Armstrong's initial trip to space. There, the action cuts back and forth between the cockpit, mission control, and Armstrong's home, as his wife Janet (Claire Foy) begins to worry he might not get back to Earth. Finally, there's Apollo 11. You know how that plays out. Singer started by working from James R. Hansen's biography on which the movie is based, but from there he went deeper. For the X-15 sequence -- which remains entirely in the cockpit with Armstrong -- he headed to Armstrong Flight Research Center, where he pored over Armstrong's pilot notes and comments. Then, Singer himself was subject to a flight simulator. "It's really a big, fancy video game where I get to try to land the X-15," he says. The Apollo was a bit trickier, given how iconic it is. Singer listened to the comms (which are readily available for everyone online) and dug into the Apollo Lunar Surface Journal and Apollo Lunar Flight Journal. "I could not make heads or tails of them until I had been studying this stuff for three years, and then suddenly I was like, 'Oh wow, this is the greatest thing in the world,'" Singer explains. "They not only have the transcript, but they also have what happens and how. When you get to this landing, what's really challenging is there were far more issues and nerve-racking issues than anyone really knows." He added small bits of dialogue to the transcript in order to convey just how hairy the journey was, like in moments where Armstrong and Buzz Aldrin are met with unfamiliar alarms or low fuel. "We just need a little Hamburger Helper to help the audience understand what's going on," he says. Singer was also in conversation with the production's technical advisors, among whom were astronauts Joe Engle, Mike Collins, and Al Worden, as well as NASA's Frank Hughes. "With all of this, we have to edit this stuff down," Singer adds. "Gemini was an eight-hour mission. Apollo was an eight-day mission. We're not going to be able to show all that on film, so how do we get the highlights?" The information that Singer collected didn't just go into his script. He conveyed his research to Chazelle, the VFX team, and the production designer so they could manifest it physically. Each flight required an exact model of the craft Armstrong was supposed to be occupying. However, there was a bit of a cheat for Apollo. "[That] is the same craft they used in Apollo 13, which we just cleaned up and modified slightly to be like the Apollo 11 craft," Singer reveals. The planes and modules would be set up on a gimbal rig -- which replicates the bumps and lurches of flight -- surrounded by a giant screen with a diameter of about 100 feet in a semicircle. That screen would then display what was supposed to be happening outside so Chazelle could capture those moments where the atmosphere reflects in Armstrong's gear. "They build out the whole sequence on the LED screen so you shoot the whole thing and then you can see the reflection in his visor and actually in his eyeballs as he's going through the different strata," Singer says. Chazelle wanted to stage the moon landing in earthly space, as opposed to a studio, so filming took place in a quarry. "The thing that was challenging about the quarry is it was the coldest winter in Atlanta history, and so we were fine until it started snowing on the moon, at which point we had to stop shooting," Singer says. "We actually lost like a day and a half of shooting because of the snow and the ice on the moon." As for simulating the low-gravity environment on the moon, the team used wires and balloons to aid the actors' movement. There was a big debate on the day of filming, Singer says, as to whether to leave Armstrong's visor down for much of the sequence, with Hansen doing on-the-spot research as to what actually transpired. "By the time we did get a straight answer, we had already made a decision," Singer explains. "That was really Damien and Ryan deciding let's save the moment where you see Neil for the greater [moment]. That way you can feel the wonder he's feeling just by really seeing this world and this view really behind his eyes as opposed to looking at him." 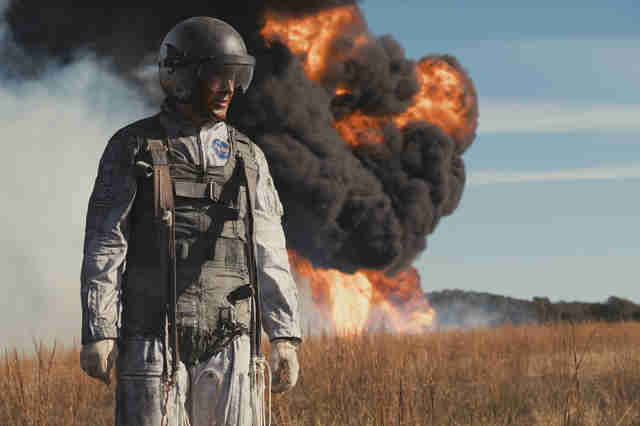 In one of the film's final moments, the camera shifts to Armstrong's perspective as he drops a bracelet owned by his deceased daughter, Karen, into a crater. It's an intimate gesture that's powerful in context, but nonetheless raises questions of accuracy. Singer explains that while it's certainly conjecture, it's not conjecture for drama's sake. It's in the biography. "[Hansen] asked Neil's sister, do you think this might have happened, and Neil's sister said I dearly hope so, and it's not uncommon for folks to leave things like that on the moon," Singer says. "So it felt like this might be a possibility." The bracelet drop -- and the choice to include it -- gets to what Singer thinks is "provocative" about the film's take on Armstrong. "People want to have it both ways," he says. "They both want a portrait of astronauts that don't cry at death and just are perfectly stoic, and they also want those same astronauts to be warm and fuzzy and jokey and guys' guys." In First Man, though, Armstrong is stoic to the point of coldness. It's not the jovial American hero some viewers might want. 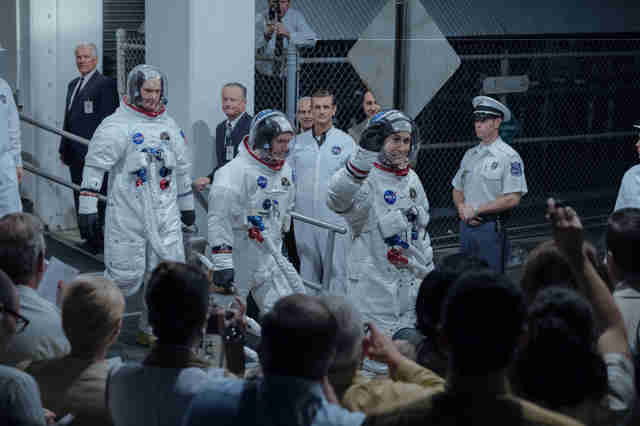 In order to get to this point, Singer wanted to be as accurate as possible in his depiction of both Armstrong and the narrative of NASA's mission to land a human on the Moon. It's one of the reasons he and Hansen are releasing an annotated version of the screenplay, to be as upfront as possible about where they've adhered to reality and where they've taken creative liberties. That way, it's harder poke holes in their narrative. "We show a guy who does manifest grief and does struggle with these things, but pushes them down in a way that we know Neil did, and as a result is a bit distant at home, which is what we were told," Singer says. "We're trying to show a real human here, as opposed to what has come before in terms of portraits of astronauts and of this time which is these superheroes with a lot of sugar-coating around it. We're trying to puncture that myth."